MILES MORALES: FRIEND OR FOE TO HYDRA? MILES confronts his family’s past and his terrifying future The man behind the mysteries of the HUMAN FLIES plans reveals himself… and it’s NOT good news for Miles. All this and Miles unleashes a NEW SPIDER-POWER! Cover– Mostly red and an army of Green are the colors of choice this time! 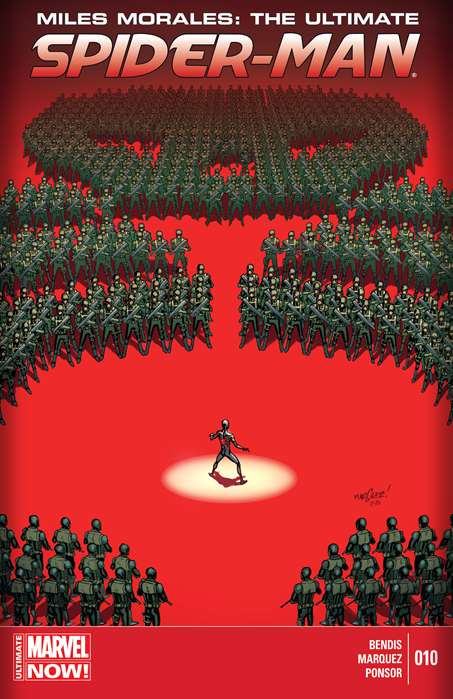 Miles stands in the center under a spotlight surrounded by Hydra Agents in the formation of the Hydra symbol. Art-David Marquez continues to dazzle, I dare say he’s now rivalling Sarah Pichelli! The emotions are well expressed; The regret on Jefferson Davis’s face as he sat down to talk with Miles’s principal was straight out of an HBO series. Black Hero– All hail Miles Morales the Black Spider-man, still here, still awesome and still one of the best books out there! Summary- Maria Hill and the police force head to a warehouse but fail to locate the Spider-Twins who have been at large since Miles Morales Ultimate Spider-man #1. At Miles’s school Jefferson meets with the school principal about his absence and return. Miles runs into a supervillain brawl between Sabretooth and Electro. With the help of Cloak and Dagger he makes short work of them and also gets some relationship advice. He next heads to his girlfriend’s house where he father a Hydra agent poisons him and he passes out. Characterization- I love me some Miles Morales, it’s no secret around here. Having said that, what has made him so endearing to me has been the damn good execution of his personality by Brian Michael Bendis. His friendships, his reaction etc. They say the devil is in the details and this book has so many details it blows others out the stratosphere! Hydra- Did Agents of Shield make Hydra Cool or was Hydra so cool that it was used in Agents of Shield? I have no idea but I love it!